Masha Chernyakova is at the School of Physical Sciences and at the Centre for Relativity and Astrophysics (CfAR), Dublin City University, Glasnevin, Dublin 9, Ireland. The centre of our Galaxy hosts a supermassive black hole that currently emits electromagnetic radiation extremely weakly, but could have been much more active in the past. Observations of γ-rays have revealed two huge structures known as Fermi bubbles located above and below the Galactic plane1. These bubbles are filled with highly energetic particles moving at close to the speed of light, which were released from the Galactic Centre a few million years ago. Writing in Nature, Ponti et al.2 report X-ray observations that reveal chimney-like structures connecting the region around the Galactic Centre to the Fermi bubbles. The authors used more than 750 hours of X-ray observations made by the space-based XMM-Newton and Chandra telescopes to obtain the first detailed X-ray map of the central region of our Galaxy, an area of around 300 × 500 parsecs. (For comparison, the distance from Earth to the Galactic Centre is about 8,000 parsecs.) This map reveals two elongated, quasi-linear structures, each about 160 parsecs in length, above and below the supermassive black hole at the centre of the Milky Way (Fig. 1). Ponti et al. name these two structures the northern and southern Galactic Centre chimneys. Figure 1 | Galactic chimneys and Fermi bubbles. 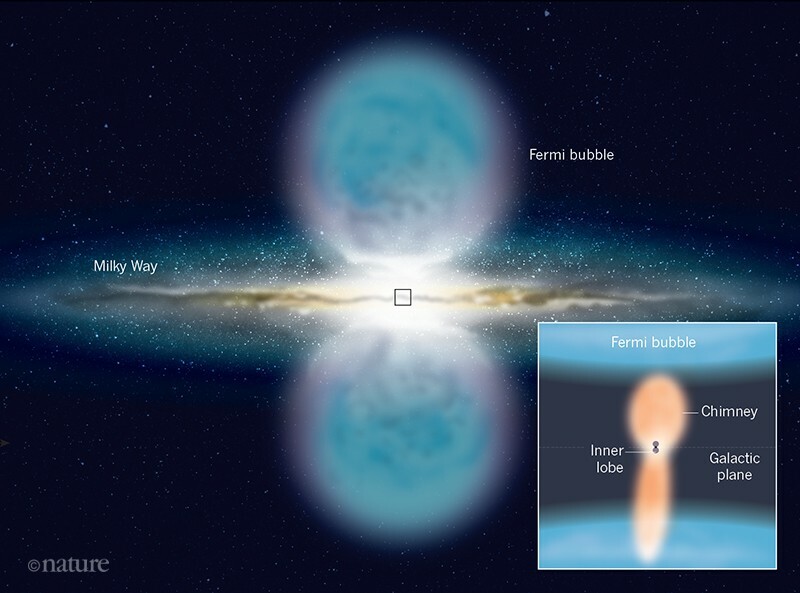 Two huge structures, known as Fermi bubbles, are located above and below the plane of our Galaxy1, and are centred on the supermassive black hole at the Galactic Centre. The bubbles are filled with highly energetic particles released from the Galactic Centre a few million years ago. X-ray and radio observations have also shown a much smaller pair of lobes of outflowing matter coming from the Galactic Centre. Ponti et al.2 now report X-ray observations that reveal two ‘chimney’ structures that seem to connect the inner lobes to the Fermi bubbles. Previous X-ray and radio observations revealed two smaller lobes of outflowing matter, at a scale of about 15 parsecs, located above and below the Galactic plane3,4. The chimney structures connect these lobes to the Fermi bubbles, which start from about 100 parsecs above the Galactic plane and occupy a huge region approaching the size of the Galaxy itself. 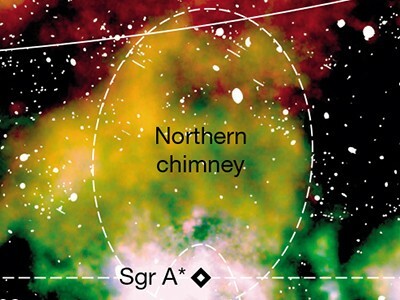 The similarities between the northern and southern chimneys suggest that they have a common origin, most probably connected to the Galactic Centre. The chimneys seem to be well confined in the direction along the Galactic plane and have sharp edges at their vertical extents. Both are filled with a hot plasma (at a temperature of about 8 million kelvin) and have a total luminosity about a million times greater than that of the Sun. The observed temperature and luminosity are consistent with the idea that the plasma in the chimneys is heated by energy released during the explosion of massive stars concentrated near the chimney bases. However, although the plasma filling the smaller, inner lobes is also heated by supernovae, the new X-ray data do not support the idea that the chimneys are a direct continuation of the inner lobes. It is more likely that massive stars in the Galactic Centre are distributed non-uniformly, leading to the formation of separate outflows: a small one close to the supermassive black hole, and larger ones at the chimney bases. The morphology of the chimneys suggests that they could be channels excavated by the powerful outflows from the supernovae at the chimney bases. Ponti and colleagues suggest that the chimneys might transport energy from the active region of the Galactic Centre to the Fermi bubbles. Various models have been used to estimate the power needed to create and sustain the Fermi bubbles, but the estimates differ by several orders of magnitude1,5,6. The lower end of these estimates comes from models in which the Fermi bubbles were created by a population of cosmic rays (consisting of protons and heavier ions) produced during supernova explosions in the Galactic Centre5,7. The energy involved in this scenario is in the same ballpark as the observed energetics of the chimneys. It should be noted that the observed energy values are at the lower limit of the total energy produced by the chimneys, because only a fraction of the total energy will be deposited as X-ray-emitting plasma. In this supernova-powered scenario, the supermassive black hole has only a secondary role. However, the morphology of the central Galactic region could also be the result of extremely energetic outbursts produced after the accumulation of gravitationally disrupted stars close to the black hole8. In this case, the chimneys could facilitate the propagation of matter and energy from the black hole to rarefied, low-pressure regions above the Galactic disc7. The black hole might also generate outflows that are thousands of times more energetic than its observed radiation, as is the case for some other galaxies9. The discovery of the chimneys is another jigsaw piece in our picture of the complex processes that govern our Galaxy. But there are still many questions to be answered. At present, only part of the region at the base of the Fermi bubbles has been observed. Observations of the whole of this region will help to clarify whether the X-ray emissions from the chimneys are traces of outflows of gas passing through the inner lobes, or come from the heated gas surrounding the lobes. Detailed radio observations of the region occupied by the chimneys, and comparison of the features revealed by radio and X-ray observations, are also needed to help us better understand the energy transport from the Galactic Centre to Fermi bubbles. Su, M., Slatyer, T. R. & Finkbeiner, D. P. Astrophys. J. 724, 1044–1082 (2010). Ponti, G. et al. Nature 567, 347–350 (2019). Morris, M. et al. Astron. Nachr. 324 (suppl. ), 167–172 (2003). Zhao, J.-H., Morris, M. R. & Goss, W. M. Astrophys. J. 817, 171–187 (2016). Crocker, R. M., Aharonian, F. Phys. Rev. Lett. 106, 101102 (2011). Kataoka, J. et al. Galaxies 6, 27 (2018). Lacki, B. C. Mon. Not. R. Astron. Soc. 444, L39–L43 (2014). Roberts, S. R., Jiang, Y.-F., Wang, Q. D. & Ostriker, J. P. Mon. Not. R. Astron. Soc. 466, 1477–1490 (2017). Churazov, E., Forman, W., Jones, C. & Böhringer, H. Astron. Astrophys. 356, 788–794 (2000).